Hi, I’m Erik. Thanks for watching my talk! Over the years, I’ve done a lot of blogging and expressed a lot of opinions on this site. I can, in the broadest terms, divide this into two tracks. The technical stuff (and there’s a lot). Over the years, I’ve done deep dives in subjects, most prominently including unit testing/TDD, home automation, and static analysis. If you want a good introduction to the technical body of, click here and see more about my Pluralsight courses, books, and this blog. The career and business-oriented stuff, which you can find an introduction to here. Obviously, if you’re coming here from the Developer on Fire talk where I linked to this page, you’ve gotten more of a sample of number 2 above. If you liked that and want to dive in further, then your first stop is probably the link for (2) or just poking around the site. 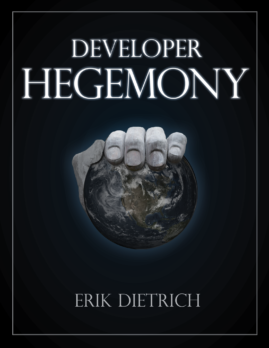 But, if you’d really like to take the plunge into a new, realpolitik way of thinking about corporations and your career, you can check out my book, Developer Hegemony: The Future of Labor. As I explain in this blog post, it’s a book that asks (and answers) a relatively simple question. “Why are software developers among the least important and influential people in the software development industry?” I propose a future where, instead of 8 layers of management above us, we, software developers, are in charge of the software development industry.